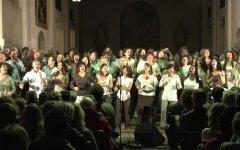 The Fine Arts Connection MUSIC group is probably the most well known as it has been providing programs for the longest time. Most notable is the annual Summer Band Concert Series which began in the late '90's with a few concerts by the American Service Bands. The Concert Series began in 2003 with six bands and has grown to today's nine bands! MUSIC has brought the Connecticut Opera Express into the school system with their presentation of "Amahl and the Night Visitors". A joint concert with the New England Symphonic Band and the Farmington Valley band was held in 2004 at the historic Thomaston Opera House. Future plans include assisting with providing new presentations for the schools and the greater Thomaston Community. 7:00 p.m. - 8:30 p.m.
last minute updates as to the rain location. 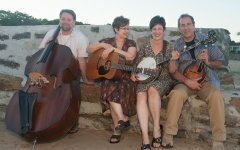 Traveling freely between the genres of bluegrass, swing, Celtic and jazz, a Too Blue performance is a dynamic dose of serious fun. Smooth harmonies and adventurous musicianship bring stellar arrangements to life and leave the listener anything but “blue”. 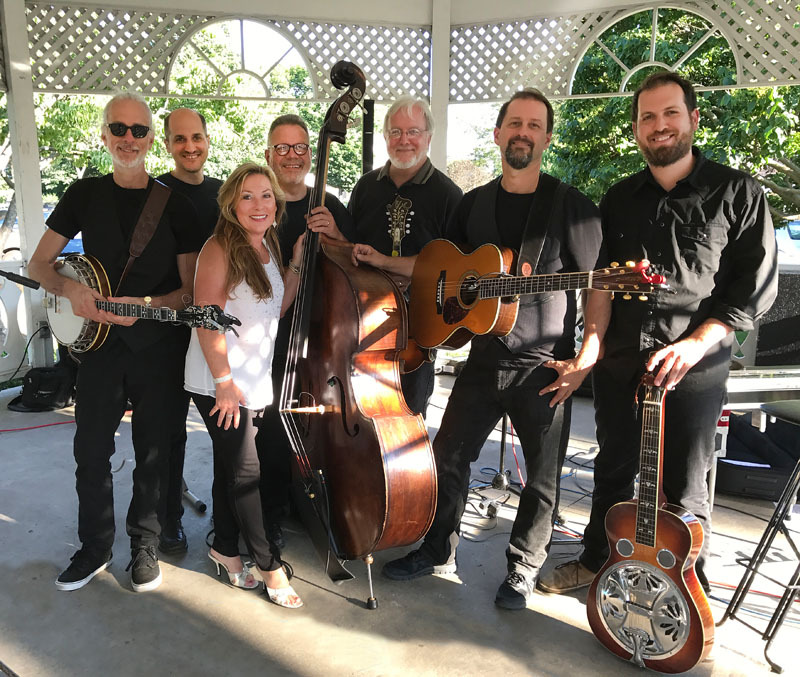 Their newest release, “Trouble With the Grey”, produced and engineered by Bob Harris of Ampersand Records, has received national radio airplay and enthusiastic reviews from Bluegrass Today and Bluegrass Unlimited. Seamlessly blending their vocals are guitarist Betsy Rome and banjoist Joan Harrison. Mandolin powerhouse Michael Sassano astounds and entertains, while jazz bassist Jamie Doris brings a creative and unique perspective to the band. Together, Too Blue makes exciting bluegrass that swings and entertains. 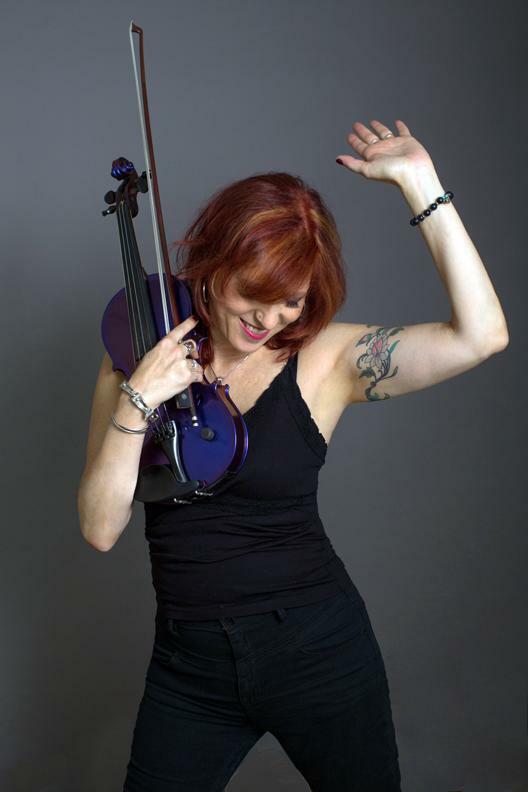 Deni Bonet is a singer/songwriter, electric violinist, and multi-instrumentalist. Deni has a stellar resume, having performed and recorded with Cyndi Lauper, R.E.M., Sarah McLachlan and many others. Her previous appearances include Carnegie Hall, The Great Wall of China, the United Nations, and the White House for President Obama. For the past several years, Deni has been touring in the US and Europe, and has become an in-demand act, headlining various festivals, performing arts centers, clubs, colleges and international venues. Her music has been featured on HBO, NBC, American Airlines, several film and modern dance projects. She was recently honored to be awarded a grant through the Arts Envoy Program of the US Government to spend a month on a residency in Africa teaching violin, songwriting, and rock ’n roll at a music college in Zanzibar. Deni Bonet has released several CDs of her own original music, including last year’s critically-acclaimed “Bright Shiny Objects” on Zip Records/Sony-RED. Bound to be one of the standout records of 2017, I’m calling this early as one of my favorite records of the year. Just finished listening to this masterpiece. The playing is so damn rich and fine and tempered and textured; the melodies are strong and enveloping. The Roylety Steel Pan Band, led by Jim Royle, is based out of Fairfield County in Connecticut. The group performs throughout Connecticut and in the tri-state area, performing at private parties, corporate events, weddings, anniversaries, Caribbean theme parties, and children’s educational concerts. 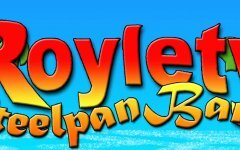 *Roylety Steel Pan Band’s repertoire ranges from traditional songs from the Caribbean (Yellow Bird, Jump In The Line), to reggae styles, Jimmy Buffett, and Latin styles. 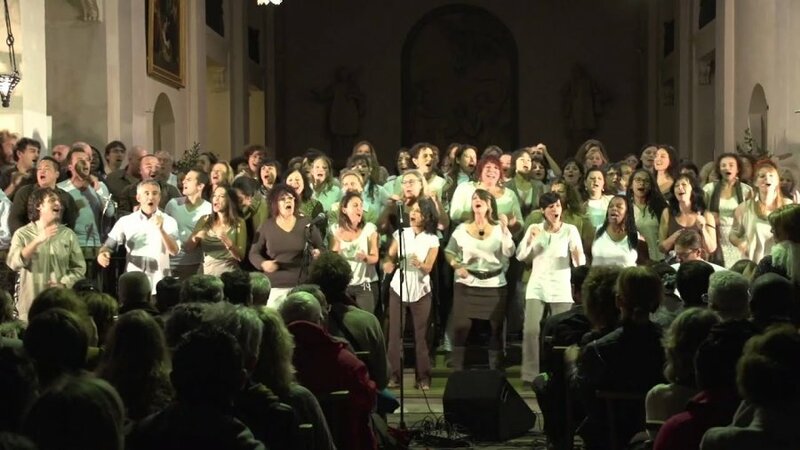 The Good News Gospel Choir is a 50-voice, multi-denominational singing group founded by Chris Coogan that performs nearly every weekend at churches, festivals, fundraisers and various community events throughout the state of Connecticut. The group has released three albums, 1997’s Joy, Unspeakable Joy, 1999’s Light a Candle. and the breakout album of 2006, Every Day I Want To Praise You. Relive the era we all loved with Pierce Campbell on guitar and vocals, Tony Pasqualoni on bass, Loren Evarts on piano and vocals and John Rispoli on drums. This hot band of high level pro musicians, who have been playing together in an assortment of bands since the ’80s, will have you on your feet singing and dancing from start to finish and leave you smiling at the end of the show! 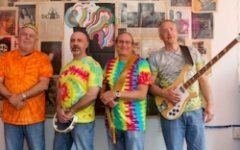 The band started in June of 2015 after being asked to play The New Haven Arts Council’s 50 Year Anniversary Party on Audubon St in New Haven. It was a ’60s themed party and the council was having trouble finding the right band for the event. Pierce suggested his classic rock band, The Scramble, which already knew many 60’s songs. With a bit of rehearsal, and about 15 strategic new songs added, they could play an entire night of ’60s music. He re-named the group for the event, ‘60s Satisfaction, and the party was a huge success. Both the band and the audience had such a great time, the guys said,” Ya know, maybe we should do this more often, let alone, we already owned the tie dye t-shirts,” and as they say, the rest is history. ’60s Satisfaction was born. The band picked up several more shows right away through Pierce’s contacts in CT Park and Rec organizations and they were off and running. One administrator commented that the group was the perfect band for people who come out to summer concerts. 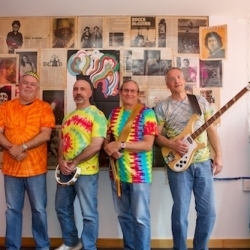 ‘60s Satisfaction has top notch players, is fun, upbeat, and everyone can sing along. What more can you ask of a summertime concert! 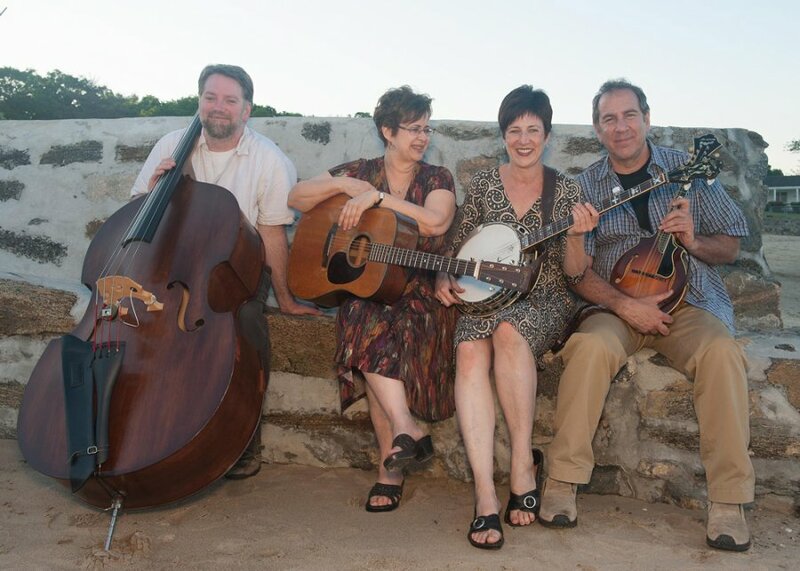 The Goldrush Band was founded in 2002 by Mary Beth and Gary Sippin, of Sandy Hook, Connecticut. Mary Beth and Gary have performed together for over three decades and have appeared on many national stages, such as the Grand Ole Opry, TNN, and hundreds of local concert venues. 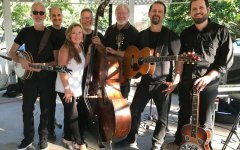 The Goldrush sound is a blend of music that crosses many boundaries of American music, but is rooted heavily in traditional country, bluegrass and American folk. That being said, Goldrush is well known for taking great songs from many other genres and giving them a new life powered by a broad array of acoustic instruments that portray these beautiful songs in a different light. Goldrush music is also simply based on the stuff that we really like to listen to! Our musical range is very wide mostly due to the fact that the musical tastes of our musicians is equally broad. Overall, our sound is acoustically pure, energetic and harmonic. We are fortunate to have the flexibility with our sound mostly due to the fact that we have a lot of different instruments to choose from. Among the instrumentation are several styles of acoustic guitar, five string banjo, mandolin and tenor mandolin, dobro, pedal steel guitar, acoustic bass, piano and organ. The Goldrush sound is also distinguished by our soaring vocals, featuring our founding band member Mary Beth Sippin. Her vocal range includes everything from high-energy rockers to the most intimate ballads. Our repertoire also features a significant volume of original material written by many of our band members. 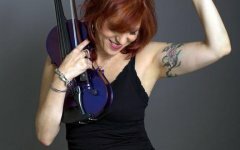 Hailed by Billboard Magazine as a “singer’s singer” Liz Queler has performed on the stages of Carnegie Hall, The Newport Folk Festival, and with the Dallas Symphony. 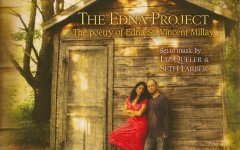 Daughter of renowned opera conductor Eve Queler, Liz has staked her claim in other musical genres with five critically acclaimed CD’s of original folk/rock and Americana as well as a CD of jazz standards. 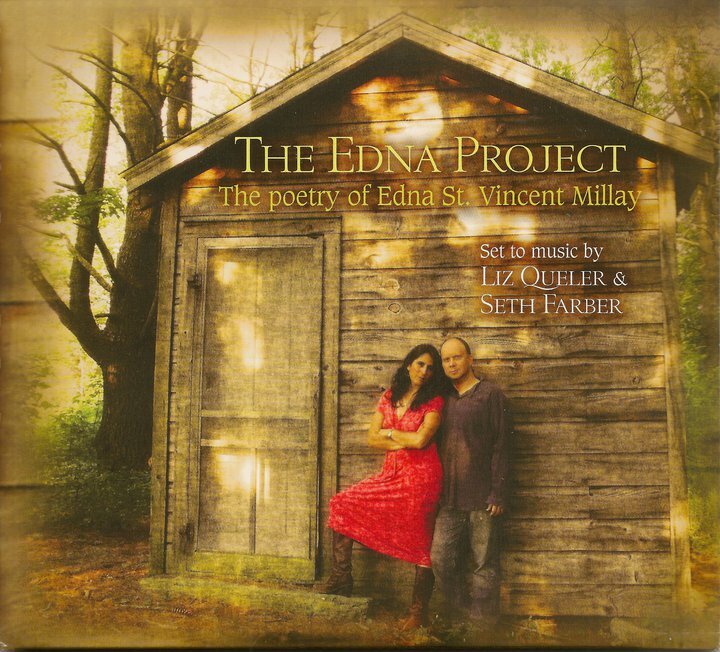 Her most recent CD The Edna Project set 21 poems by Edna St. Vincent Millay to music. With compositions by both Liz and her husband, Broadway conductor Seth Farber, this song cycle inspired the theater piece Still Will Be Heard for which Liz wrote the book, and which was commissioned and produced by Peak Performances at Montclair State University (NJ) in June 2014. A finalist for the Woman in Arts & Media Collaboration Award, The Montclair Times called Still Will Be Heard “A powerful work of art.” Liz continued exploring Millay’s texts with a setting of “Renascence”, an epic piece of 214 lines. “Renascence” made it’s NYC debut at Lincoln Center’s Alice Tully Hall in the fall of 2015. Liz has composed for TV and worked extensively as a studio singer including national jingles (Meow Mix, Exxon, Sprite and Estroven), film scores The Little Mermaid, Barney’s Great Adventure and the PBS American Masters’ biography on Lucille Ball for which she sang “My Funny Valentine.” As an instrumentalist she played Leonard Bernstein’s “Mass” with The Dallas Symphony, and in the pits of the off Broadway shows 10 Million Miles and The Great Unknown. Liz tours frequently with her husband and son. Together they composed and performed “Raised On Love” for Rosie O’Donnell’s HBO special A Family is A Family, and will release their first CD in 2016. The latest collaboration for this husband/wife team, is a musical adaptation of the children’s folk tale “The Little Red Hen”, which will be released as an ebook/app by Ever After Tales. 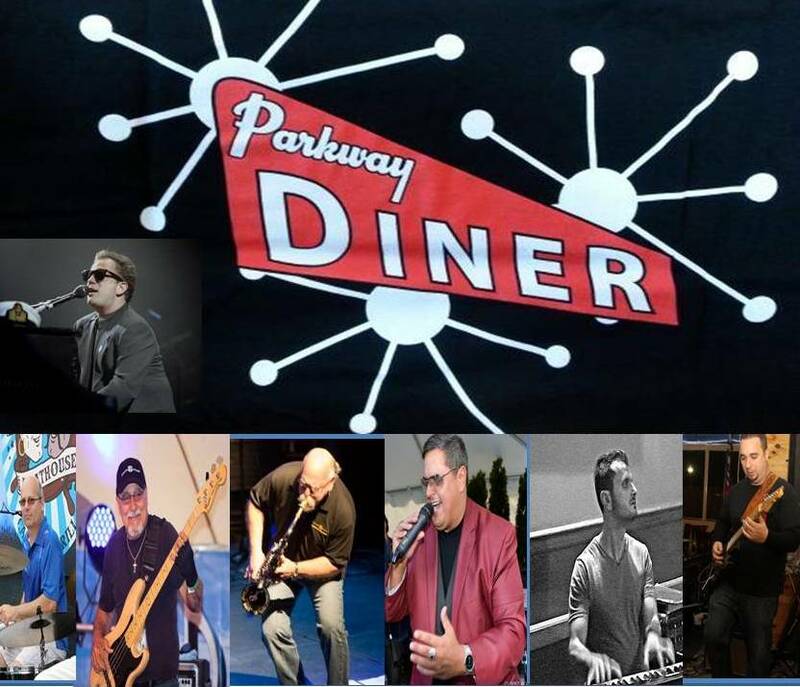 Parkway Diner Band began a few years ago as a duo, with J.J. Martin manning the mic, & Chris Dabbo on keys. They moved around Ct. for a couple years doing shows of all types, with a very Billy Joel heavy song list, while covering many of your favorite artists’ tunes as well. Picking up momentum over time, they felt it was time to grow. So a couple of years ago they added Alex Banlaki on guitar & Phil Soltis on drums. Then, to take Parkway Diner to the next level, they needed to add that vital to all rhythm sections piece. That very special bassist, Jay Gerbino. Done! To polish things off, the band drew from a very special well of seasoned saxophonists. 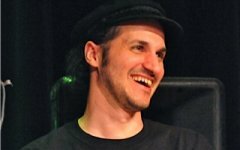 And was very fortunate to be able to add it’s final piece, Anthony Masi, to bring their sound to exactly where they want it to be. 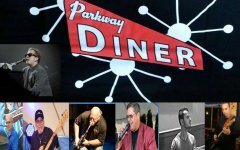 Now, Parkway Diner is coming at you strong, with the classic hits of Billy Joel, while filling the air with powerful renditions of songs that you’ve enjoyed, all your lives. 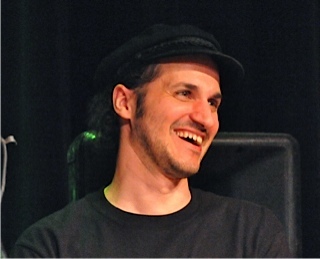 For over 20 years, Coogan has led the Chris Coogan Quartet, a combo with a repertoire that includes straight-ahead jazz, fusion jazz and boogie-woogie. S’Funky, Coogan’s first jazz album containing his original songs, was released in 1995 and re-released in 1999. It features the song Cranberry Isle which took the top jazz prize in the 1997 John Lennon Songwriting Competition. Coogan’s credits as a jazz musician include performing with the late Sal Salvador, Bette Midler, Donna Summer, Paul Newman, Whoopie Goldberg, Jo Ann Woodward, Alec Baldwin, Gene Wilder, Larry Coryell, Dave Liebman, Harold Danko, Ronnie Spector, James Naughton and Phoebe Snow, as well as arranging for Teo Maceo, producer for the late Miles Davis He appeared on television’s Celebrity Jeopardy and the Arsenio Hall Show and has performed at Manhattan’s Blue Note and the Montreaux Jazz Festival. to meet the needs and desires of everyone.